First and foremost let me apologize for any spelling or grammatical errors. English is not my native tongue. Well let us get on with the review. 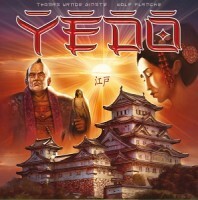 Yedo is set in ancient japan where you are the leader of a house vying for control in the city of Yedo. This will be done by sending your disciples on missions, trading and blocking your opponents (the other houses). The Components are of a sturdy quality. The disciples are made of wood, the rest of the came consists of cardboard and cards. The main board and player boards are beautiful, and even though the main board seems busy when you first look at it, you will learn quiet quickly to navigate the different spots with ease. The rules are very simple to understand. And even though the game is somewhat on the meatier side, it is very easy to play, mainly because of how well designed the rulebook and main board is. The game consists of several phases. The first being a auction. Here you can get vital items or missions. If you manage to win these auctions you can save a lot of resources, however this is also a great place to force your opponents to overspent on items they desperately need. The next phase is the event phase. There are a lot of different events making for a fresh feeling every time you play the game. These events can be the locking out of certain areas, or the players losing their recourses to earth-quakes and other bad events. There are some really evil events called marked with the word samurai. Some players prefer to take these out of the game, to make it less mean. Personally I love them and I think it helps to elevate the theme of a struggle between houses in feudal Japan. After that there is the phase where you allocate your disciples to different spots on the board where you want to take actions. Be careful because after that the city watch moves, and if you are caught you can lose your disciples. And then we come to the action phase where you get to use your disciples for different things, be that trading or going on missions or even stealing from the church. The missions are fantastic. They each tell a little story, and the great part is that the weapons etc you need to get and the places your disciples need to go all make sense with what the mission is. Well this game is dripping with it. The artwork, the missions and even the mechanics of the game all help to make you feel like you are back in feudal Japan and fighting against the other houses. I love this game. If you are looking for a thematic worker placement game, that also has tons of interaction and is mean, you will love this game. There is a reason why this is one of my all time favorite games. OK I’m pretty new to serious board gaming so my review is based on my limited experiences. I guess the bast way I can review this game is by comparison to other similar games I have played. As other reviewers may have already mentioned the closest game I have played to Yedo is Lords of Waterdeep but Yedo has much much more to it than Waterdeep. think of it as Waterdeep on steroids. The games objective is to gain as many prestige points as possible by the end of the 11 terns (years). You do this by completing missions that come in 4 difficulties. the requirements for the mission are a combination of weapons, geisha, blessings and sending your disciples (meeples) different parts of the Yedo (the city) if you have all the requirements shown on the card and disciples on the locations you can use one of the disciples actions to complete the mission and takes the rewards. which can be mon(money)/items/cards/prestige points or a combination of the above. each card also has a bonus section if you can satisfy the bonus requirements as well as the basic requirements when completing a mission you get to claim the bonus rewards as well. once the bidding phase is done the event card is revealed which can be good or bad or neutral depending on the game. warning some event cards are very bad like earthquake which can leave your strategy in tatters. Personally I like it but some people don’t. there is also a policeman mechanic in the game which affectively closes off one area of the board. so you will need to plan for this or use action cards to use the policeman against the other players. then players start placing their disciples in order to take the action or full fill mission requirements and for trading which is only allowed if both players who want to trade have disciples in a certain area on the board. once placement is done the disciples are removed to activate the chosen action to complete missions. and the turn starts over again. I’ve played the game a few times now and though its a bit hard learn and explain you get the hang of it after one or two games. I really like this games unpredictability and theme. you can still plan but you will have to have a plan b and c just in case. It also brings a nice tension into the end game. However this is a relatively long game with 4 players it takes on average about 2 – 2.5 hours.This is one of my favourite games. Add a Review for "Yedo"